My week of training with my company was long and intensive. Fifteen of us new-hires sat in a room for about eight hours a day, taking notes and doing on-the-spot activities that would prepare us for teaching in public Japanese schools. During this time, we chugged vending-machine tea and did our best to keep up with the lessons while retaining our sanity. Occasionally, we were given five-minute breaks to stand up, walk around, and use the bathroom. 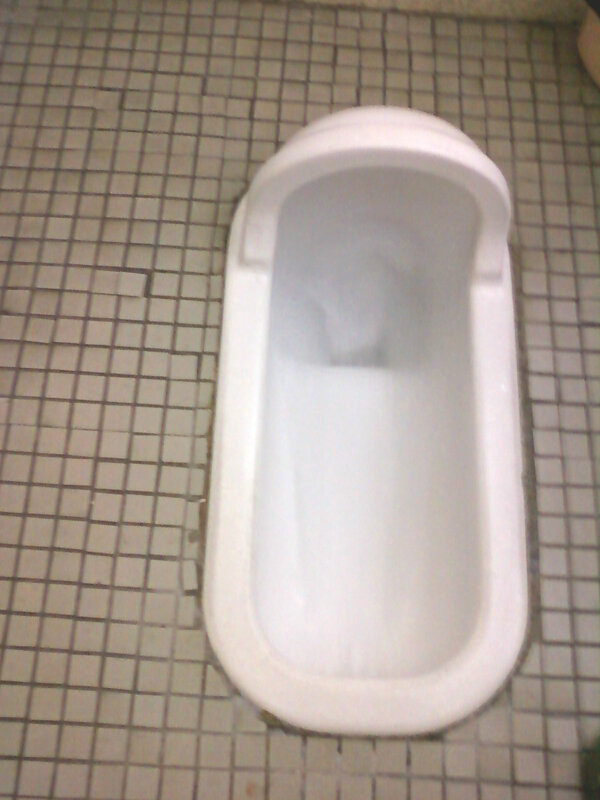 For many Westerners, the squat toilet concept is shrouded in mystery. Squat toilets, to my knowledge, are mostly prevalent in Asia, so many Westerners never encounter one until they cross an ocean or a continent. The idea of squatting over a toilet—rather than sitting on one—seems ridiculous, bizarre,and possibly demeaning. Royalty sit on a throne; commoners squat over a hole in the ground. Yet squat toilets can be found in establishments of all kinds, from hole-in-the-wall pubs to posh hotels, like the one my co-workers and I were staying in. 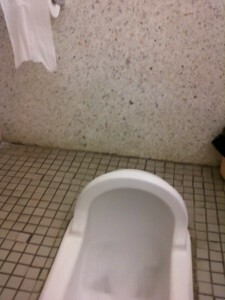 Japanese schools possess an even ratio of squat toilets to sitting toilets, and there are squat toilets in most public restrooms. There seems to be no stigma in Japan (or Taiwan, where I previously spent a year) against the squat toilet. The design of squat toilets can vary, but the kind I usually see is the long, narrow basin in the ground, with a hood on one end. 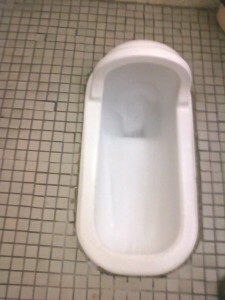 That’s the end you face, while planting your feet on either side of the basin and squatting down. For beginners, this can be an awkward position. Some toilets have a bar on the wall that the toilet-user can hold onto. The flushing mechanism is usually in front of or to the side of the toilet, and is either a lever or a handle to push. Make sure you use your hands to flush, not your foot. I used my foot until I went into the kindergarten toilets in one of my schools and noticed a diagram on the wall to teach the kids proper toilet etiquette. It had a big “X” on a picture of someone flushing the toilet with their foot. Oops! There is one rumor about toilets in Asia that I can confirm, and that’s the lack of availability of toilet paper—although I’ve found that public toilets in Japan provide toilet paper even less reliably than toilets in Taiwan. In both countries, however, you’re at constant risk of being caught with your pants down and no toilet paper. Make sure you always have a pack of tissues with you in case of emergency. Japan even takes this a step further and doesn’t always provide soap or paper towels, so to dry your hands you’re sometimes left to either wave them around, wipe them on your pants, or do as the Japanese do and always carry a little hand-towel. Even Japanese schoolchildren have a hand-towel to dry their hands with after they wash.
What it all comes down to is this: if you ever travel to Japan, you’re bound to come across a squat toilet. There may not be toilet paper, so again, bring your own. If squatting isn’t a comfortable or easy position for you, the mechanics of using the squat toilet might seem like more trouble than it’s worth. Its purpose is the same as any toilet in the West, though, and it works just as well. If you stay in Japan long enough, it’ll fade into the background noise of life, and you’ll start wondering why anyone acts like it’s a big deal. After all, it’s just a toilet!